Half of all ambulance callouts to the University of York this year have been for incidents of self-harm or suicide attempts. Those stark figures are included in a report from the university's student mental ill-health task group. Between 1 January and 8 February 2016, there were 12 emergency callouts for self-harm or suicide attempts, 50% of the total. In the previous full calendar year, there were 134 such callouts to the university, with suicide attempts or self-harm accounting for 32%. In 2014, there were 158 ambulance call-outs, with 14% because of self-harm or suicide attempts. This is Mental Health Awareness Week, and there has been much concern about a perceived increase in mental health problems among students. There have been warnings of an increase in demand for counselling and claims that universities are not taking their pastoral responsibilities seriously enough. 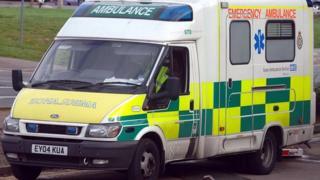 But this is a sensitive topic, and it is unusual to get such evidence as this ambulance data. The report, gathered for York's vice-chancellor and shared with students, says that both the "prevalence and severity" of student mental health problems is getting worse. The report refers to figures for the University of York, but it also includes evidence from more than 50 universities. This was gathered by the association representing university student services (AMOSSHE) and found a "noticeable increase in complex mental health crises" in 2015 compared with 2014. And in almost 90% of universities, staff reported working on such incidents with either the police or a coroner during 2015. The report from York says its experience reflects this national trend, with more demand for counselling and health services. It says the fact local NHS mental health services are also overstretched makes the problem even more difficult. And it warns of a "paucity of high-quality evidence on the mental health of students in the UK", adding: "This is particularly surprising given the size of the student population." The report says students can suffer from a misguided sense of "perfectionism", feeling under pressure to succeed at everything and responding with feelings of "low self-esteem, depression, anxiety and hopelessness" when things go wrong. Social media is another significant cause of problems, with students having to respond to an ever-present "virtual environment", which can include cyberbullying and victimisation. And there are problems related to young people being away from home for the first time, relationship worries and anxiety over money. The York report cites figures from the Office for National Statistics (ONS) for 2007 to 2011, showing student suicides peaked in 2010 at 127, with a significantly higher incidence among men than women. Further figures held by the ONS, show 109 student suicides in 2012 and 100 deaths from suicide in 2013. It means there were more than 30 suicides each term across the UK - but it does not suggest an increase. And across the whole age population, those under the age of 30 have the lowest suicide rates. But these figures do not say anything about incidents that might have been attempts at suicide. And there seem to be repeated warnings of an increase in problems. NUS Scotland is reporting a 47% increase in demand for counselling services between 2011-12 and 2014-15 and says universities are struggling to respond. Oxford student Meredith Leston, who supports the Student Minds charity, says there is a "big mental health problem in universities", but too often it remains concealed and unsupported. "Mental illness remains greatly stigmatised," she says. "Opening up about mental difficulties is one of the hardest things a young person can do. "Struggling mentally is considered a sign of personal weakness as opposed to the legitimate health concern it really is. "As such, young people are more likely to continue blaming themselves for their own problems rather than opening up and seeking help for it. "This just produces a generation suffering in silence." Image caption Will there be enough help available when students need it? Sir Anthony Seldon, vice-chancellor of Buckingham University, wants universities to be more open. "We need much greater candour about mental health problems, and universities can lead the way," he says. "It is much more prevalent than many would like to admit." Sir Anthony says more effort needs to be put into prevention, promoting the importance of wellbeing, resilience and a healthier lifestyle. York's vice-chancellor, Koen Lamberts, who has been brave enough to put this information into the public domain, says the report "highlights a growing issue, not just for universities but for society as a whole". "Rates of mental ill-health are increasing," says Prof Lamberts. "We wanted our staff and students to feel able to talk about what that means for the university."